Admit it. You want to eat cookies for a meal. In fact, you’ve probably eaten cookies for a meal before. I know I have. Somebody else had the same idea. 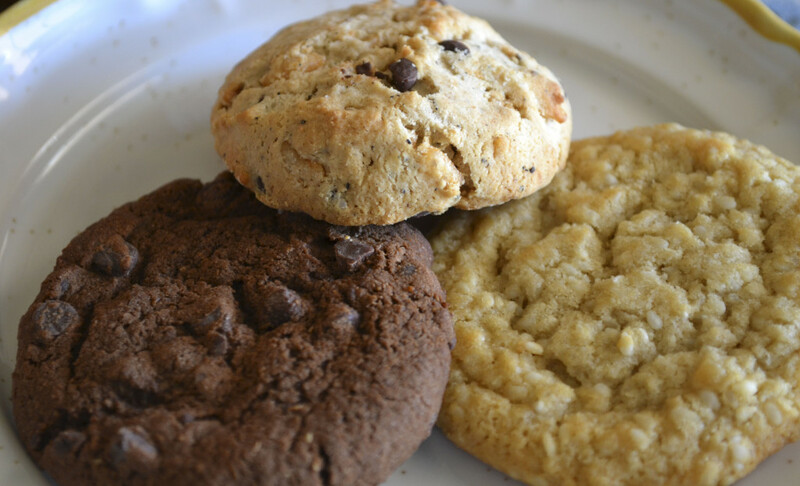 Certified gluten-free, vegan, and no dairy, soy, egg, nuts, or corn, these cookies are made with sesame meal as the “flour.” Two cookies contain 4-7 grams of protein, 3-4 grams of fiber, 6-10 grams of sugar, and 11-15 grams of fat. They even contain 15% of your daily value of iron. In. A. Cookie! Sesame cookies…who knew? I’ve never had a sesame cookie before. These cookies are firm and a little soft, with a very interesting flavor. There is a LOT of sesame flavor, surrounded by sweet, buttery goodness (but there’s no dairy!). Corice gives it a thumbs up, but Carter isn’t quite sure about all the sesame seeds. I like it, but it is probably something that I’d be more likely to have once in awhile (though if I eat it once in awhile, I may like it even more). The Chocolate Chip cookies are very akin to a shortbread cookie, in that it has that dry, crumbly texture. It has some crispy puffed rice in it (I had to look at the ingredients to figure it out), that break it away from a typical shortbread, though. You can’t tell it is made with sesame meal. Carter and Corice both think it is the best of the cookies. 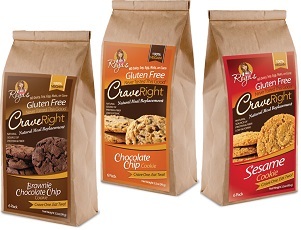 CraveRight would like you to try their cookies, too! They’ve got a set of three bags (one of each kind) for TWO lucky winners! To enter this giveaway, simply leave a comment about your favorite time to eat cookies (you know mine’s breakfast, lol). This giveaway will close at 9pm central on Tuesday, January 28, 2014. Don’t forget to enter the Ian’s giveaway and the ThinkThin giveaway. My favorite time to eat cookies if right when I get home from work (especially after a long day)! I can have a childhood moment to the day back in balance. These look delicious! Always room for a cookie at night with my cup of tea! My favorite time to eat cookies is late at night in bed! I could eat cookies all day long!! Although I try to limit my sweets and only have dessert after lunch. Mine is late at night after my daughter has gone to bed and I decide to make a batch of cookies! Must be warm and served with milk! Is there ever a bad time to eat a cookie?? But my favorite time is when I’m relaxing in the evening, with a nice cup of coffee. My favorite time to eat cookies is in the evening, after dinner and watching a TV show! My favorite time to eat cookies is in the morning with my coffee! I like to have cookies late at night with a glass of ice cold milk.